At JoBananas we always take care to make sure your jewellery arrives safely. 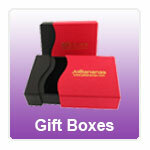 We supply all products from the Elegance and Fake Belly Bars range in our own branded gift boxes. Additional gift boxes can also be purchased on the website.